International applicants will need to go to the International Students page for specific information regarding how to apply to JMI as an international student. We can accommodate info sessions on the weekend and after hours for those that have school or work commitments. Please fill out the contact form on the right of this screen or give us a call on (07) 3216 1110 or e-mail play@jazz.qld.edu.au to organise a time that suits you. 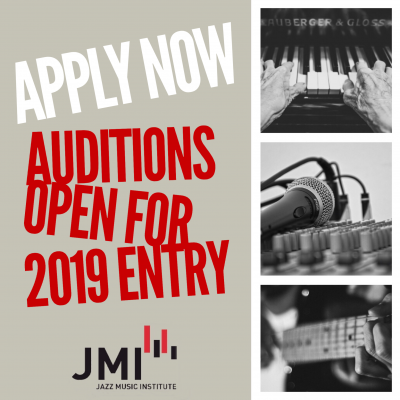 To apply for courses at JMI, applicants will need to arrange an audition. We will be holding auditions by appointment between 1st July 2018 and 31st January 2019. To arrange an audition, you will need to complete the Application for Audition Form. Send this form through to JMI and our administrative staff will contact you to arrange a time. A $30 audition fee is required to be paid before the audition. The audition process for Certificate III & IV in Music Industry (Performance) is outlined below. If you are unsure of the specific information please contact the office for further clarification. You can also arrange lessons with staff prior to your audition. Applicants are to prepare 2 contrasting pieces. These could be in the style of a blues, jazz standard, ballad, latin/bossa or other. Guitar, Electric Bass & Piano applicants must perform these scales and arpeggios in 2 octaves. Major scale in one key only. – C, F and G.
The audition process for the Diploma of Music in Jazz Performance is outlined below. If you are unsure of the specific information please contact the office for further clarification. You can also arrange lessons with staff prior to your audition. If you are unable to complete some of the following requirements, you may be offered lessons with staff or short courses after your audition to enable you to be deemed eligible for entry into the course. Instrumentalists (brass, woodwind, bass, guitar, piano) and drummers are to select 2 pieces from the list below (1 piece from each list). Vocalists are to select 2 pieces from List B only. Applicants will perform these 2 pieces with the rhythm section provided by JMI on the day of audition. N.B. If you would like to get the sheet music for the repertoire below, please contact JMI directly. Guitarists are to demonstrate the above information in at least 2 positions. •	Major scales in the keys of G, C & F.
•	Basic rhythmic construction: quarter and eighth notes, and rests. •	Write major, minor, augmented, and diminished triads. •	Major, minor and dominant seventh chords. 3. Name degrees (numbers, letters or solfege) of major scales over given tonics (scale tone recognition). The audition process for the Bachelor of Music in Jazz Performance is outlined below. If you are unsure of the specific information please contact the office for further clarification. You can also arrange lessons with staff prior to your audition. If you are unable to complete some of the following requirements, you may be offered lessons with staff or short courses after your audition to enable you to be deemed eligible for entry into the course. Decisions on auditions are made by an audition panel comprised of key academic personnel at JMI. Decisions will be made in accordance with JMI’s Fairness Procedures which are available on the Academic Policies page of this website. There is an expected 4-week turnaround from when an applicant performs and audition to when they find out their audition results. Applicants will be notified via letter in the mail of their results unless otherwise notified or requested. To gain entry into this course, applicants will need to undertake an audition as per the audition requirements set out for this course. Only applicants deemed successful by the audition panel will be granted an offer to enter this course. Applicants do not require an ATAR score (OP for Qld applicants) to gain entry into this course. Applicants that have previously undertaken VET study will be eligible for Advanced Standing through the audition process. Applicants looking to gain advanced standing (credit) for previous study will need to bring all documentation of their prior study along in their audition. An assessment will be made by the audition panel on whether the applicant will be made an offer for the course and how much credit (if any) they can receive for their previous study. This assessment will take into account both the performance ability of the applicant and the knowledge gained from previous study as per JMI’s Credit Transfer and Recognition of Prior Learning Policy available on JMI’s Academic Policies page. Applicants that have previously undertaken Higher Education study will be eligible for Advanced Standing through the audition process. Applicants looking to gain advanced standing (credit) for previous study will need to bring all documentation of their prior study along in their audition. Applicants that have a significant amount of work and life experience in the field of jazz performance can be eligible for Advanced Standing through the audition process. Applicants looking to gain advanced standing (credit) for work and life experience in the field of jazz performance will need to bring along their CV outlining the depth of their performance experience. An assessment will be made by the audition panel on whether the applicant will be made an offer for the course and how much credit (if any) they can receive for their experience in jazz performance. This assessment will take into account both the performance ability of the applicant and the knowledge gained from previous study as per JMI’s Credit Transfer and Recognition of Prior Learning Policy available on JMI’s Academic Policies page. Applicants will need to demonstrate an adequate level of English Language proficiency prior to gaining entry into this course. The following is deemed adequate and will require providing documentation (in brackets) at the point of audition. If applicants cannot demonstrate an adequate level of English Language proficiency at the time of audition, they will need to undertake a STAT test at QTAC (www.qtac.edu.au) and gain an overall score of 150 or better prior to being offered a place in this course. If you are unable to achieve this score then you will need to complete a preparatory course in English to be able to enter this course. Contact JMI for more information regarding English preparatory courses that are available. – details of fees and options for payment of fees. Applicants can accept their offer by completing the Application for Enrolment Form and Fee Payment Options Form that will be enclosed with the Letter of Offer by the required date of reply stated in the letter. The table below gives an indication of the likely peer cohort for new students at the institution. It provides data on students that commenced undergraduate study and passed the census date in the most relevant recent intake period for which data are available, including those admitted through all offer rounds, across all Australian campuses, and international students studying in Australia. Please call or e-mail the above for any queries regarding the course, enrolment, audition process, fees etc.